The Washington Monument is visible from the Holiday Inn Washington DC’s rooftop pool and from some guest rooms. 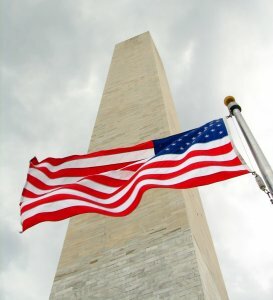 The Washington Monument is the tallest and most prominent structure in Washington DC. The structure was built in honor of the first President of the United States, George Washington. The monument is notably the one of Washington DC’s first attractions. The monument was designed to be shaped like an Egyptian obelisk and was originally designed to be part of a much larger monumental display. The monument stands at 555’ 5 1/8” tall. When at the top of the monument, visitors can see as far as 30 miles.